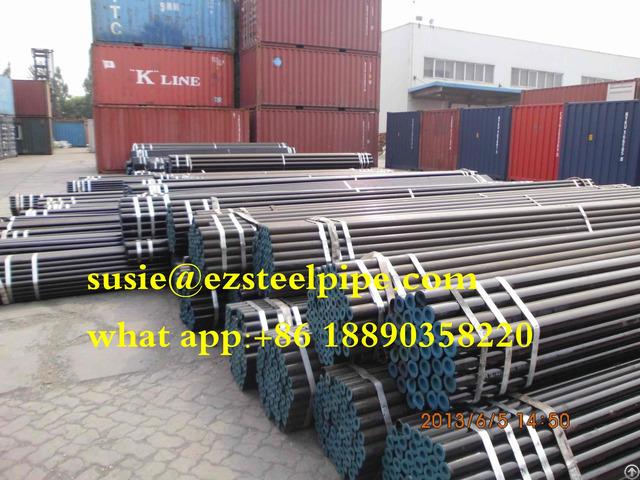 Business Description: EZ STEEL INDUSTRIAL CO.,LTD is the export division and window company of EZ STEEL GROUP, which was founded in 1996 and has been committed to the development and manufacturing of steel tubes in the past 20 years. It is one of the largest steel pipe manufacturing enterprise groups in China. The group possess fixed assets over ￥200million and more than 800 employees with annual production capacity over 300000t. The company has continuously introduced the world advanced manufacturing equipment and now is able to produce SAWL, SAWH, ERW and seamless steel tube with diameter 12.7 mm–3048mm and wall thickness 1.20mm–75mm. We also have our own pipe coating facilities and matched workshops for further processing. After years of development, EZ STEEL GROUP and the affiliated enterprises have obtained many kinds of domestic and international certifications including ISO9001 Quality Management System Certification, ISO14000 Environment Management System Certification, API 5L、API 5CT、CE、License for Manufacture of Pressure Piping in China, etc. Our company has obtained good domestic achievements and is the nominated supplier of CNPC, SINOPEC and CNOOC. The products are exported to Southeast Asia, the Middle East and Africa, Europe, Australia, and Latin America and other regions and countries via other foreign trade companies, and are widely used in oil and gas pipelines, oil field construction, urban water supply and drainage project, pile foundation construction, power plant construction and steel structure works, etc. Holding the concept of “First-class brand, fFrst-class service, First-class value”, EZ STEEL GROUP is aiming to build up a win-win enterprise platform for both our customers and employees.